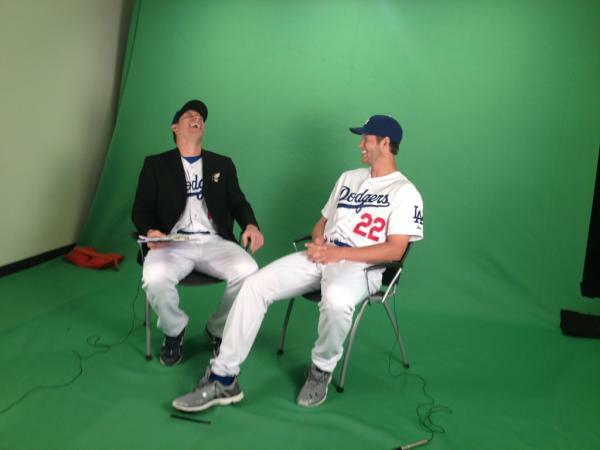 AJ Ellis interviews Clayton Kershaw for a future DodgerVision feature, via twitter @dodgers. GETTING TO KNOW YOU: The last day of workouts prior to games kicked off this morning with Dodger skipper Don Mattingly implementing a new wrinkle during the daily team meeting. Mattingly started the getting-to-know-you process yesterday by introducing bench coach Trey Hillman to the team. Today, the responsibility fell on some younger players’ shoulders as Josh Wall introduced Jerry Hairston, Jr. to the club and Rubby De La Rosa familiarized the Dodgers with right-handed reliever Todd Coffey. Mattingly plans to continue the presentations over the next couple of weeks. GAME TIME! 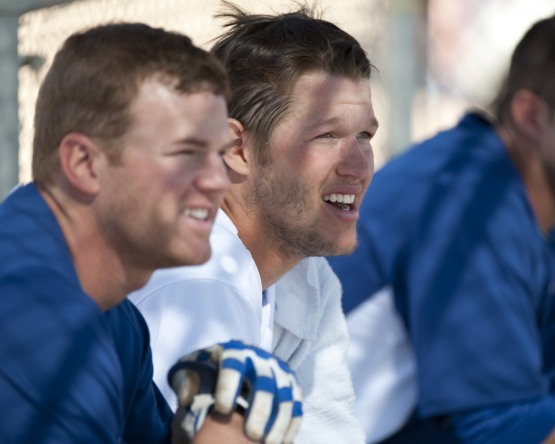 (sort of): This morning at 11:00 a.m., several Dodgers took part in an intrasquad game on the minor league side, specifically pitchers Clayton Kershaw, Chris Capuano, Stephen Fife and Will Savage and catchers Matt Treanor and Gorman Erickson. The hurlers each threw 2.0 innings while the catchers recorded three at-bats in the contest, which consisted of eight half-innings. Kershaw stuck out five of the seven batters he faced and allowed just one hit over 25 pitches. Capuano did not allow a hit or walk while striking out two over 2.0 innings. Fife and Savage each allowed an earned run in their 2.0 innings of work. Kershaw will make his first “official” start of the Cactus League season on March 9 against the Rangers in Surprise. RUBBY SUNDAY: The Dodgers would like to wish a very happy 23rd birthday to right-handed pitcher Rubby De La Rosa, who is progressing well after undergoing Tommy John surgery on his right elbow last August. De La Rosa went 4-5 with a 3.71 ERA in 13 appearances (10 starts) in the big leagues last season before the injury. The native of the Dominican Republic shares his big day with Brooklyn Dodger Hall of Fame pitcher Dazzy Vance. CACTUS LEAGUE LID-LIFTER: The Dodgers open up their Cactus League season as the designated visiting team tomorrow against their Camelback Ranch neighbors, the White Sox. RHP Chad Billingsley will get the start for Los Angeles with RHP Nathan Eovaldi, RHP Fernando Nieve, LHP Wilfredo Ledezma, RHP Angel Guzman, RHP Ryan Tucker and LHP Scott Rice in relief and right-hander Philip Humber taking the hill for Chicago. The Dodgers open their home slate on Tuesday with LHP Ted Lilly on the mound against the Giants’ Barry Zito. GONE BUT NOT FORGOTTEN: On this day 100 years ago, groundbreaking ceremonies were held for Brooklyn’s Ebbets Field. This season is the 50th anniversary of Dodger Stadium presented by State Farm and the club will begin the special season at Chavez Ravine on April 10 vs. Pittsburgh. 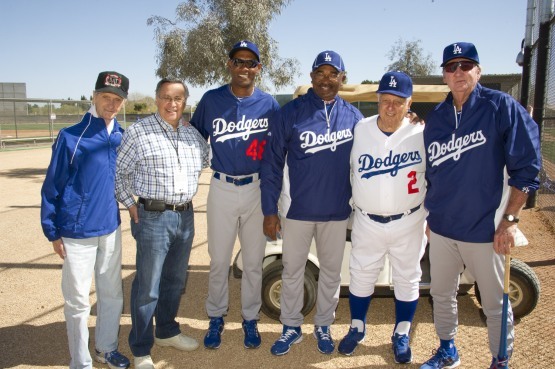 THE GANG’S ALL HERE: Many of the Dodger broadcasters have descended on Camelback Ranch – Glendale over the last few days as Hall of Famer Jaime Jarrín showed up on Thursday, while Charley Steiner and Pepe Yñiguez arrived Friday. This afternoon, former Dodger outfielder and current KABC broadcaster Rick Monday landed in Phoenix, ready to call the game alongside Steiner tomorrow afternoon on the Dodgers’ new radio broadcast partner, AM 570 Fox Sports Los Angeles. Jarrín and Yñiguez will call the contest for KTNQ 1020, entering their second year as the Dodgers’ Spanish radio partner. The club would also like to welcome Efren Meza, the new Dodger producer for the Spanish radio crew. MAJORING IN THE MINORS: Dodger minor league pitchers and catchers have their first workout on March 5 and all other minor leaguers report on March 9 with the first full-squad workout taking place on March 11. 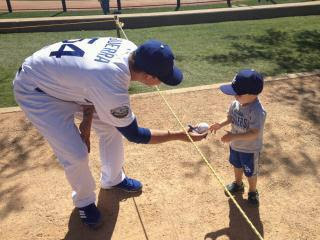 The farmhands will hope to repeat their success from last season, when six of the Dodgers’ seven minor league affiliates ended the season with winning records and the teams’ cumulative .543 winning percentage (414-349) was the second highest among Major League clubs behind only Texas’ .565 mark (431-332). In addition, four of the seven clubs reached the postseason with the Rookie-level AZL Dodgers winning the Arizona Summer League championship. Here is this weekends Sunday Dodger Videos. Watch this vintage Vitalis commercial featuring Don Drysdale. Here is a Bob Hope Special from 1978 "Salute to the 75th Anniversary of the World Series" that takes a look back at a 1963 clip featuring Don Drysdale, Sandy Koufax and Tommy Davis. A couple of years ago I ran into a press photo that I thought was from a Las Vegas musical review show, but as you can see it's not. It is actually from a Bob Hope special from 1963. See that original post here. Here is outfielder Mike Marshall with announcer Ross Parter in a commercial from 1984. Here is a 1987 MLB commercial featuring Dodger Baseball. Fernando Valenzuela makes a brief appearance and so does Nancy Bea.